An old traditional style of airlock that is still preferred by wine makers during an ML fermentation and for longer term aging. A 3 piece style airlock (FE370) is preferred for active primary fermentation of sugar because they can be easily cleaned when they get dirty. The S-Shaped is better for long term aging because the water in the airlock has less surface area and will not evaporate as quickly. They are preferred for ML fermentation because they will show positive pressure, an indication that your ML fermentation (which are very slow and hard to detect) is working. More simple than the 3 piece. Because this is the item I wanted. It's the only one they had in this style. Easy to use, no extra pieces. Need a spare, thought I'd try this type. Purchased a few of these over time so I can have different batches in fermenters at the same time. Prefer these over the three piece airlocks. Even though these air locks may seem flimsy compared to the three piece air locks, they work much better for me. Not having to keep track of three pieces. Plugged up pretty easily. Ended up blowing off the jug and across the kitchen! Seams need to be shaved. These airlocks do exactly what they were designed to do. They work. They could be improved by the addition of a flange ( about the diameter of a penny ) at the first bend above where the stopper slides on. It isn't too expensive, but will probably only work once well. When everything starts pushing it's way up there, a few things get stuck to the sides in the "bulb" area. Starsan won't get that out either, and try getting a small brush to run through it without scratching the sides? Impossible. This is my go-to airlock. CLEANING: I'm a beer-hygiene freak and these are EASY to clean even when heavily fouled after a vigorous primary: Strong, warm PBW solution, a quick soak and a shake or two ==> clean as the day you bought them. Finish them off with a StarSan soak and Bob's your uncle. LIQUID BACKWASH: If you're sucking liquid into your carboy while cooling then you're adding too much liquid. I generally use StarSan as the liquid except where high CO2 production rates cause too much foaming. Like Mike E. suggests above, use vodka and any problems are over. CO2 MONITORING: This is the real beauty of these air-locks. You can easily detect even the most minute CO2 production. This is not essential but I love watching my beer ferment. Difficult to clean, but dump some vodka in there and forget it. Very difficult to clean. Go with the three piece - same price, infinitely better. Absolutely CAN clean...Strong PBW does wonders, even after heavy krausen flow-through. The sanitizer I put in these stoppers does not get sucked into the carboy during temperature drops like the 3 piece airlocks do. For that reason I'll throw these on before dropping to lagering temps or cold crashing an ale. They are a bit difficult to clean if your krausen gets too high and blows through it. If soaking it doesn't work I just throw it out since they are cheap anyway. Just buy more than you need to start. Works. Not as Good With Plastic Fermentors. I use these airlocks with glass fermentors, but not with plastic Better Bottles. 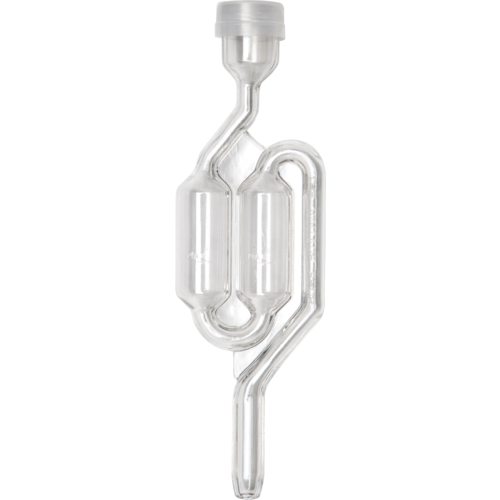 If you have to move a full plastic fermentor there is a possibility that some suction will occur. Sanitizer, vodka, or whatever liquid you fill your airlock with is more likely to be sucked out of these S-shaped airlocks than the 3-piece ones. I like these airlocks for anything I'm aging long term. Easy to keep filled. It does the job, I haven't used it for a vigorous fermentation. I would probably use my 3 piece for that. But for lower gravity brews this works fine. Yes, the 3-piece is easier to clean... I typically use a 3-piece at the beginning of fermentation when I might experience some "blow off" with a vigorous ferment. As things settle down, I switch to the S-shaped airlock because it's easier for me to gauge/see how much CO2 is still coming off the beer. I prefer the three piece ones because they are easier to clean (especially if you neglect to use a blow-off tube when you should have). Every yeast ferments differently. If super active, I use a blow-off tube, switch to a 3 piece after it stops spewing yeast and then switch to this S-type airlock during secondary fermentation. It works especially well on Lambics to see what if anything is going on. This works for a slow ferment. But when you have a strong ferment this can blow off. Also it is hard to clean. I would prefer the 3 piece airlock. I've used the one piece airlocks for years. But recently, there's been a NEW one on the market that has a very narrow 'neck' below the cap. It is made of a very hard and brittle clear plastic which breaks VERY easily! Don't get me wrong, I still use the one piece as it will NOT allow backflow of sealant liquid into a fermenter like a three piece airlock can. If you buy a one piece, which I highly recommend, be sure to get the "Italian" version with the RED cap! It is made with the same plastic that 2 liter soda bottles are made with and is tough as nails. So buyer beware..... look before you buy and if you think you're getting the old style with the RED top and get the one with the translucent white cap instead, just return it and tell them why! Eventually the cheap ones will just disappear from the marketplace. You'll thank me later! With a little sanitizer in the water, a good product. Works as advertised and easier to judge activity/water level than the 3 piece airlocks. Love this airlock. Easy enough to clean. I use them until I loose them. When carrying, it will allow the air to flow when a better bottle flexes, while the 3 piece will end up with liquid sucked into your better bottle. First put in the bung, then insert the air lock. Hey! It keeps air out! It's everything I had ever hoped for in an airlock...and more! Foot massages, turn-down service, and breakfast in bed. Since this one is weaker than the 2 piece it can bend when you are trying to pull it out of a stopper. can snake inside those bends easily, 3 piece can also be used in conjunction with blow off tubes which makes it a better buy IMO. Cool... I never thought about adding a blowoff tube to the top of the 3-piece airlock. Thanks for the suggestion! I disagree -- not hard to clean at all. See comment below. I typically start the fermentation with a piece of foil over the top of the carboy, then after a few days pop on an airlock. I prefer the S-shaped airlock over the 3 piece because of simplicity (I tend to loose the 2nd piece of the 3-pieces). Also it is easy to judge the amount of liquid in the airlock to avoid the liquid being sucked back into the fermenter. Other the the S/Z inconsistency this thing does what you would want from an airlock, which is lock air.